Managing log data across large or autoscaling environments can be a time-consuming and expensive undertaking. Logentries has designed a scalable service that dynamically supports your autoscaling environment as log volumes expand and change. By centralizing all logs across distributed instances into one secure location, you can efficiently monitor and track valuable log events in real time, without complex configurations or set-up. As your environment dynamically scales, new instances can be easily configured to send all log data in real-time to Logentries. Easily group all logs related to a single service, app or environment (e.g. Dev, Staging, Production) by mapping multiple logs from different servers into a single log in Logentries. Flexible agent, or agentless (e.g. syslog), approaches to collecting and indexing log data from various sources. Library support for common languages and frameworks allows you to log directly from your application source code. Support for micro service architectures and Docker containers. Automated deployment scripts for Chef or Puppet. No per GB overage fees for autoscaling volumes. Being more proactive and knowing if any of our data sources are working improperly before our clients know is a major life saver. This dramatically improves the services we’re able to provide our clients, and is a major return on our investment. The AWS CloudWatch Community Pack provides out-of-the-box visibility into CPU, Network and Disk Usage for your AWS EC2 environment. Get started in less than 5 minutes! 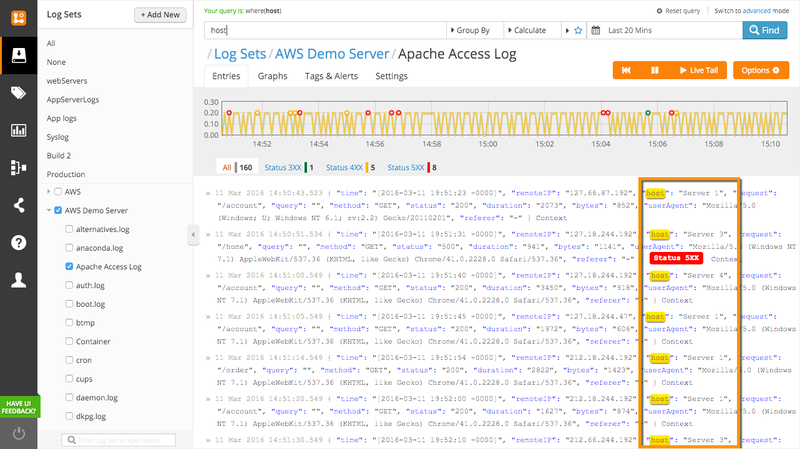 Easily centralize, monitor, and visualize your log data in real-time.